The North Carolina Department of Transportation has awarded the first of three contracts for the Complete 540 project in southeastern Wake County. The NCDOT awarded the $403 million contract to Lane Blythe Construction Joint Venture of Charlotte Nov. 30 for the part of Complete 540 that will extend the Triangle Expressway from U.S. 401 to Interstate 40. 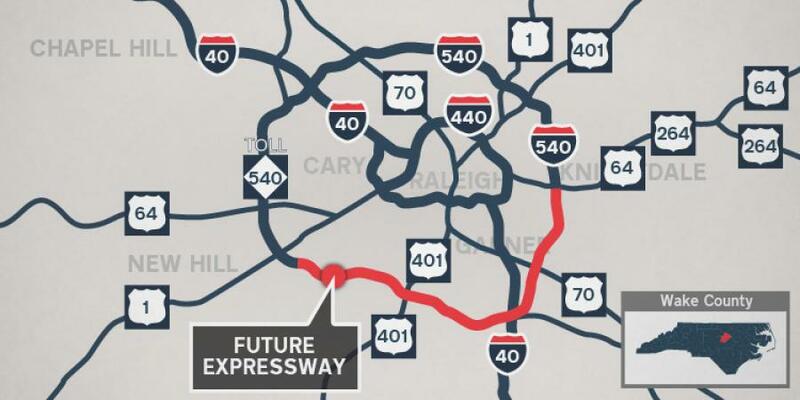 Complete 540 will link the regional roadway network by extending the Triangle Expressway around the greater Raleigh area. This link will provide commuters living south and east of Raleigh, as well as motorists making longer trips through the Triangle region, another transportation option. The contract calls for constructing a 70-mph (posted) six-lane highway from east of U.S. 401 to I-40. The project covers design and construction of a six-lane, 8- mi. highway from east of U.S. 401 to I-40 and will involve 6.5 million cu. yds. of earthwork, construction of 29 bridges and 347,000 sq. yds. of concrete pavement and placement of 149,000 tons of hot mix asphalt. Construction could begin in 2019 and the project is expected to open to traffic in 2023. Blythe Construction is a subsidiary of Eurovia, which is itself a subsidiary of VINCI. With headquarters in France, Eurovia has substantial operations in the southeastern United States — especially Florida, Georgia and the Carolinas — via Blyth Construction and its other subsidiary, Hubbard Construction.